“In opposition there is progress,” wrote William Blake. The inspired pairing of Wendy Maruyama and James Schriber in a show at Pritam & Eames, East Hampton, New York (August 12 September 16, 2005) leads the viewer to contemplate the mysterious border where art and craft intersect, as well as to admire the distinctive vision of these two furniture makers. Maruyama and Schriber have been friends since they studied together in the mid-1970’s in the Program in Artisanry, then at Boston University, and each has exerted a distinct influence on younger furniture makers. While Maruyama has made a career of teaching—she is professor of furniture design and woodworking at San Diego State University—Schriber has limited his academic career to the occasional guest lecture. In each case, however, it is their distinctive work that sparks the imagination of students, collectors and fellow makers. The aesthetic opposition is fundamental. Maruyama is a bit of a provocateur. One doesn’t expect to find large digital color collages of geishas in a gallery that shows studio furniture. It is surprising, too, to discover that the geishas are actually men—Kabuki performers photographed in the 1940s. Maruyama found the photos in smaller, black-and-white versions in Tokyo flea markets and used them as the basis for percentages, which she then turned into centerpieces for a series of wall cabinets, Men in Kimonos. 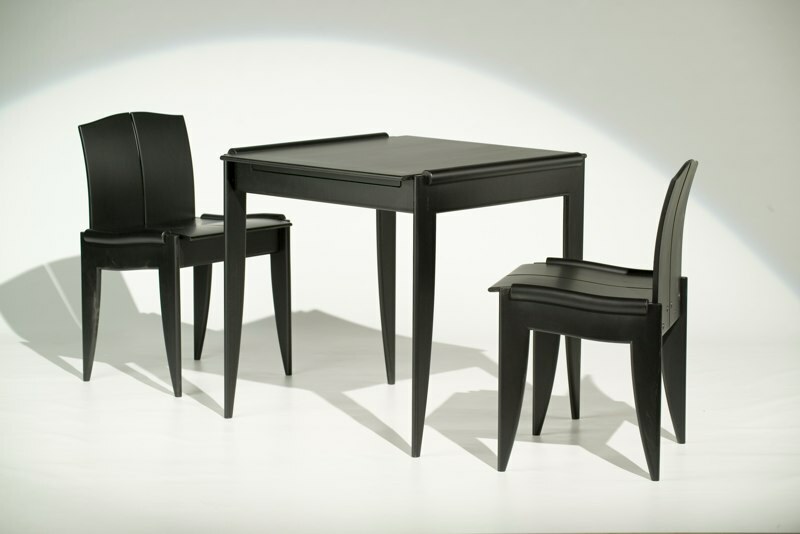 Schriber, on the other hand, introduces nothing that isn’t strictly practical—he simply makes tables and chairs—although to characterize him thus is like saying that Frank Lloyd Wright banged together a few houses. Each of his understated, elegant pieces looks utterly new while alluding to the history of the craft. 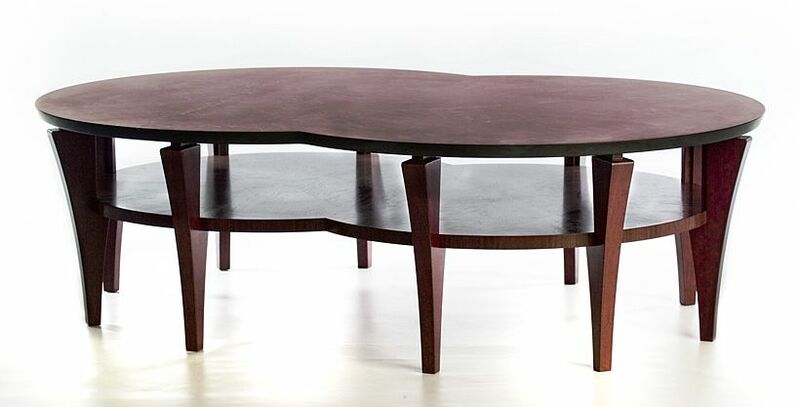 The largest elements of a piece are carried off with subtlety—dining table supports that resemble a pair of elephant tusks seem inevitable; nothing else could have looked right beneath the fiat expanse of the elliptical cherry tabletop. The simplicity of the piece is set off by subtle marquetry — small, intricately carved inlays in the tabletop’s perimeter. The chair is upholstered in mohair the color of grass with delicate lime-green piping; those colors are reversed in a matching ottoman, evidence of Schriber’s quiet humor. A coffee table of purpleheart and slate is another exercise in contrasts. The slate tabletop, with its Brancusi-like contour, is shot through with brilliant, jagged veins of quartz. The purpleheart base is extremely smooth, providing visual relief from the activity of the slate’s face. Schriber sometimes combines steel with wood. A pair of side cabinets and a console, all wenge, have perforated black steel backs-an unexpectedly airy, modernist touch. Schriber’s wit is inextricable from his elegant style, and the work on view at Pritam & Eames hints at the range of his knowledge and interest. Maruyama, on the other hand, is out to grab us by the lapels. The focus of each wall cabinet is a digital color collage, usually of a mate Kabuki. The men pose demurely, holding colored scarves. In one piece, a man in a kimono appears against a field of what resembles rushes, or beach grass, but which turned out on closer inspection to be hundreds of grassfish — slender creatures arranged vertically, like pointed sticks. In another piece, a man with a coy look seems unaware that a pink squid three times his size has begun to grasp him in its tentacles. These cabinets have shelves that can be hidden with sliding panels of fir or pearwood; the panels themselves have small slit-like windows with “bars”-little dowels in contrasting colors. The collages seem like a playful mockery of traditional screens as well as traditional culture. Maruyama’s Mashimaro is a wide but very short cabinet, perhaps suitable for a row of CDs. But to place something onto the shelves would block the view of digital prints of a toy figure that resembles a Smurf made of two marshmallows, with a toilet plunger stuck to its head. The cabinets are also framed by wood-usually curly maple with a live edge, a natural correlative to the artifice of the digital collages. Perhaps the most intriguing of the works is The Black Mirror, a symmetrical cabinet of three distinct parts, any two of which can be hidden by a sliding panel. At the right is a Kabuki collage and at the center, a color photo of dried yellow flowers scattered on a black background. The compartment at the left holds a smoky gray looking glass-the mirror of the title-meant to flatter the viewer. It is a marvelously ambiguous piece, leaving the viewer to wonder about the relationship among its three juxtaposed elements. A bubinga Big Chair is another underplayed tour de force. The armchair is as imposing as a throne, yet it is cleanly drawn, a sublimation of royal furniture of the rococo past. The massive crest rail is authoritative, but the bold stroke of its loop-the-loop shape reads playfully. Robert Long is the author of De Kooning’s Bicycle, published by Farrar Straus & Giroux. 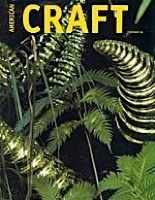 ©1994 Bullfinch Press. Reprinted by permission. Fine custom furniture design, woodworking, furniture gallery, tables, seating, beds, chairs, casework, millwork and built-ins, architectural cabinetry and furnishings, interior design. Copyright 2019 James Schriber, All Rights Reserved.